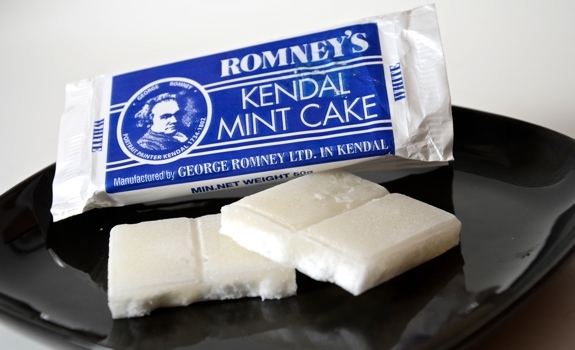 Romney’s Kendal Mint Cake, cracked in two. In honour of the American election happening tomorrow, I thought I’d do my neighbourly best by marking the occasion with that most relevant of British treats, Romney’s Kendal Mint Cake. Best Before: Aug 2012. Oops. Hope that hasn’t tainted the review. The Look: “White,” says the package. “Agreed,” says I. The cake is like a flat, shimmering, sparkly, semi-smooth sugar cube. It’s scored into four parts, which makes it perfect for sharing with your Sherpa guide. The packaging is conservative, old-fashioned and dated in a way that suggests a traditional fan base who know and love the product, and who are fearful of change. The Taste: MINTY! Seriously, I’m going to be tasting this mint cake for hours. Refreshingly cool peppermint with sweet, sweet sugar. The texture is nice, and isn’t overly hard; I successfully bit off pieces without shattering any teeth. It dissolves easily into a sugary mint paste, releasing its flavour and sweetness in a surge of taste, then pulls back and lingers. Cost: $1.39 (on sale) for a 50 gram bar at British Pantry in Calgary. Value for cash money: Not bad. Availability: Very limited in Canada. Try UK import shops. Nutrition? : No idea. No info given on package. The ingredients are sugar, glucose syrup, water and peppermint oil, so you might want to take it easy. The verdict: Good luck, America. While I wouldn’t want to endorse the Republican whose moniker this candy shares, I’d heartily endorse this mint cake. It’s just that good.